Thanks so much for stopping by. If you don't already participate in Saturday Snapshot, I hope you'll click over to At Home With Books to take a look at the easy rules and then decide to join us. We believe in sharing the fun! Do these peanuts make my cheeks look fat? That's a fabulous photo! And seems entirely appropriate for your post Thanksgiving mood. I still feel that way! Wonder what's going on with me? I loved watching those little guys-- they're expert packers, let me tell you! I'd barely took a seat on the bench when one of them ran over, climbed up my leg, and sat on my lap wondering where the food was! I imagine a lot of people felt like that on Thursday! That's too funny! He was. He wasn't going to leave until every morsel was packed into his cheek pouches! Glad you liked the shot! 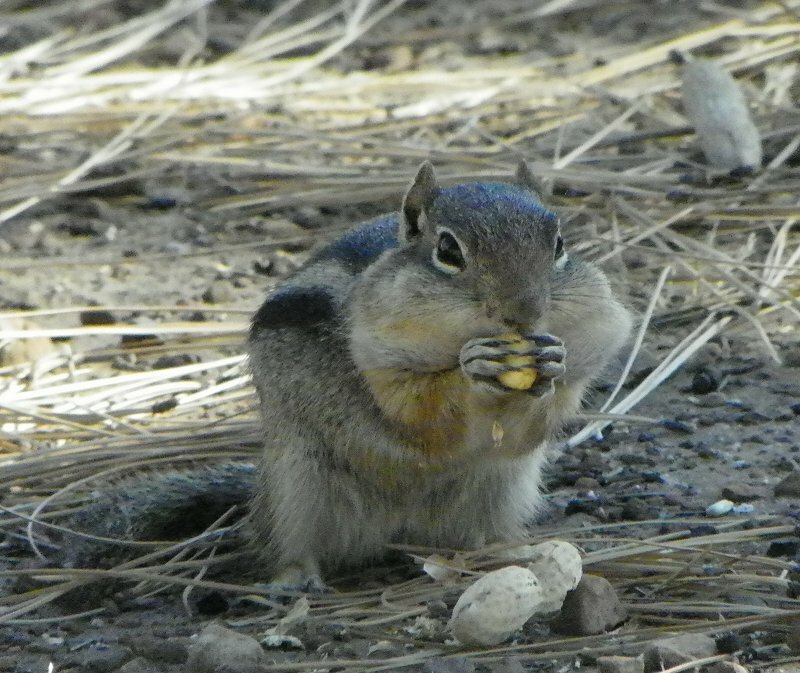 Amazing that you were able to get such a close shot - the squirrel looks like it had a big thanksgiving feast! These little critters are used to being fed, so they have very little fear. I wish I looked that cute with chubby cheeks! I laid a smorgasbord of sunflower seeds and unshelled peanuts around my feet and clicked away while they gorged themselves. That picture made me LOL! I can't helping loving squirrels although they have destroyed every herb I tried to plant. I hope he's enjoying his fifteen minutes of fame-- and all that food he packed away! The squirrel shows its gratitude-alive and well the mountain. I love seeing photos of wildlife around the world!